Today we’ve got another indoor grill review to share. 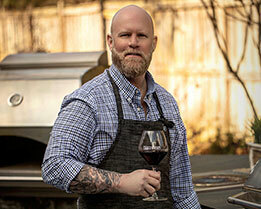 We’ve already looked at some of top players in the indoor grill space in our previous smokeless grill reviews. However, this cooker stands apart from the rest due to its unique heat source. 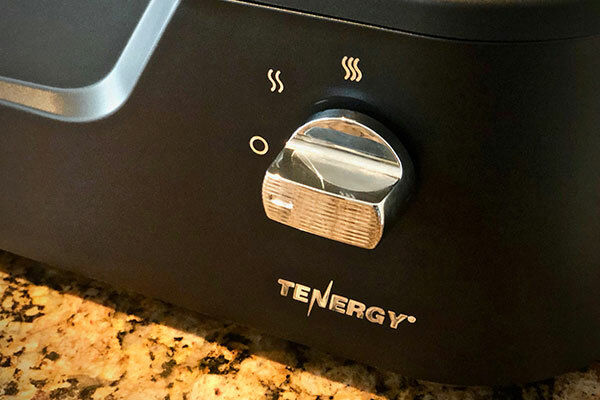 The Tenergy Redigrill is powered by two infrared bulbs instead of the standard heating element usually found in a conventional oven or indoor electric grill. The cooking grate is non-stick aluminum and there is an easily removable drip tray in the bottom. This grill is simple to set up and prepare for indoor grilling within minutes of unboxing. The fit, finish, and appearance of this particular cooker feels like a “pro” step up compared to the budget grills we have tested so far. Let’s take a closer look to see if it lives up to our expectations. 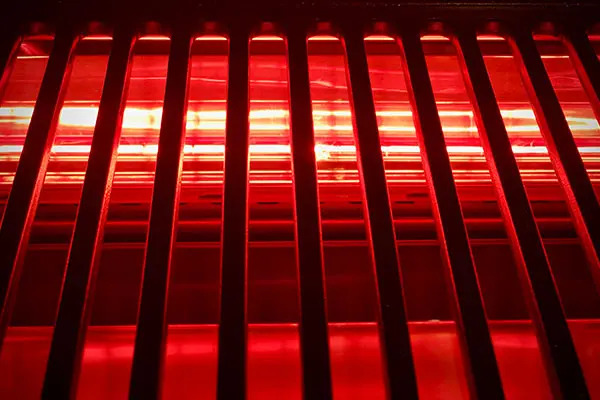 The manufacturer recommends turning the grill on in the “warm” setting for five seconds before turning the grill to “high” or “on” to heat for grilling. The infrared bulbs turned on at the “warm” setting at what appears to be half power, and at full power in the “on” position. There is no temperature controller or thermostat like the other grills we have reviewed so far. The grill is either “on” or “off” in a sense, but we found no issues from this; it worked quite well. 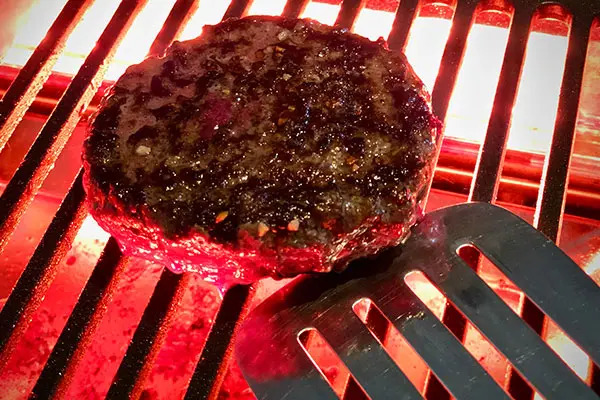 The deep red glow is bright when the grill is set to the full “on” position, which the manual states is harmless. 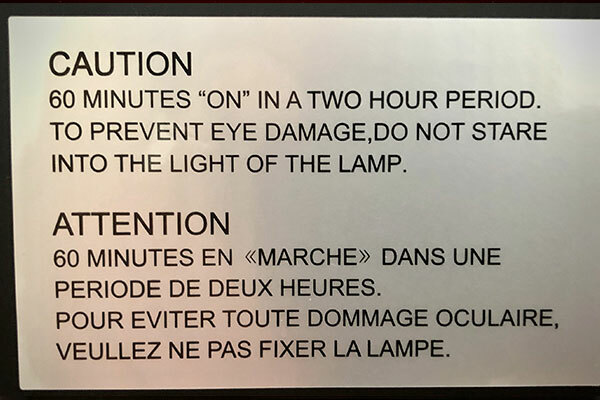 There is a label on the side of the grill that warns against staring directly at the bulbs, and we found the brightness of the light to be slightly uncomfortable to look from certain angles when cooking. The manufacturer claims the grill heats up to 446ºF within six minutes while providing even heat across the entire cooking surface. We were pleasantly surprised to find the claims of even heat up to that temperature to be true, as measured with a high accuracy infrared thermometer. This grill gets hot and radiates a fair amount of heat out of the top while the handles and base remain slightly warm to the touch. That said, the manufacturer recommends using this grill away from walls or cabinets. A kitchen island or table with an overhead clearance free of cabinets worked well for us. 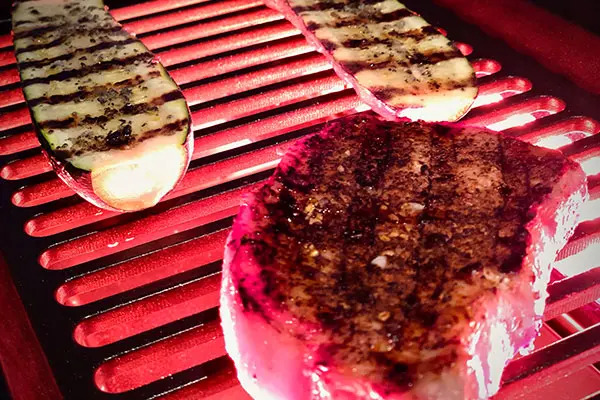 Proteins and vegetables cooked on this grill finished with an even internal temperature unrivaled by other electric grills we have reviewed so far. Sear marks were distinct and pleasing, while the foods were similar in texture and flavor to those cooked on a charcoal grill. We noticed that grease became baked onto the glass shields protecting the bulbs and other internal reflective metal surfaces, so this appliance requires cleaning like an oven every few cooks. 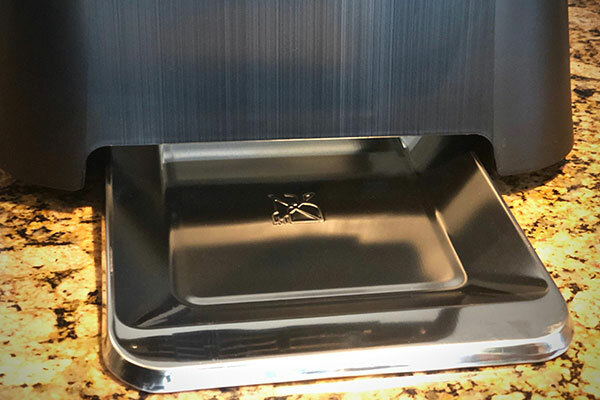 The product manual recommends the use of cleaning liquids designed for ceramic cooktops for the internal surfaces of the grill—creating an extra cleaning step compared to some other products we have reviewed. The cleaning of internal surfaces and bright lights are not considered as a drawback based on the finished quality of the food and the ease of use with this grill. *Specs taken from the Tenergy website. The grill is out of the box and ready to cook in under five minutes. Cleanup is easy due to the non-stick cooking grate and drip pan both being dishwasher safe. Unlike some indoor grilling products, there is no need to fill the drip pan with water, resulting in no chances of water spillage. The lip on the cooking grates made it easy to use with a spatula without sliding food off the edge of the grill. Foods cooked on this appliance rendered even internal finishes on proteins and vegetables while still providing a good sear. The even internal finish with proteins was unrivaled by other appliances we have reviewed to date. Thicker or bone-in proteins cooked to perfection throughout, as did vegetables. As a side note: This electric grill excels with bacon and poultry. 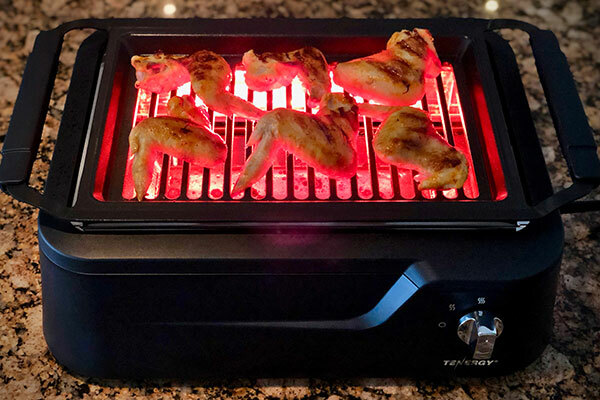 The infrared heat creates excellent crispy bacon and crisp-skinned chicken wings. The light coming from this appliance is a bit bright. Some users might have a difficult time looking at the food on the grill at times. While the drip tray is dishwasher safe, we had to scrub a bit more when hand washing it in a sink due to the tray lacking a non-stick coating. A longer cord (cord length is 13.5”) would be a welcome improvement since the grill should be used in a space away from walls or overhead cabinets. These points are easily forgiven based on the performance of the grill as-is. This cooker will find a good home just about any place where an electric grill is desired or required. While it is slightly larger and more expensive than some of the other electric indoor grills we have reviewed, the performance of the infrared heat source for cooking truly feels like a “pro” feature. 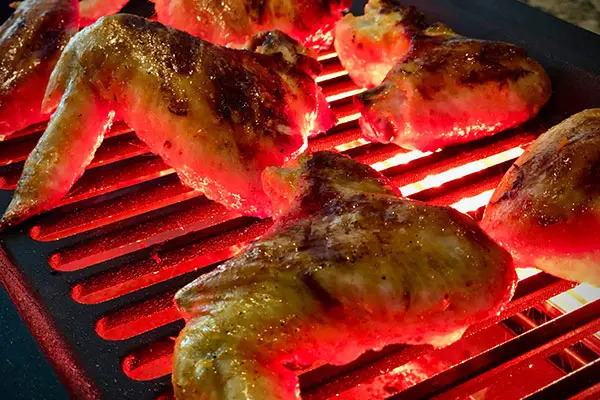 If you feel like you are missing out on the charcoal cooking experience, the red glow emanated from the infrared bulbs is reminiscent of a wood or charcoal fire—adding to the ambiance of the cooking experience. This grill will work best in a setting where it is used on a kitchen island or table away from walls or cabinets due to the amount of heat radiated out of the top. 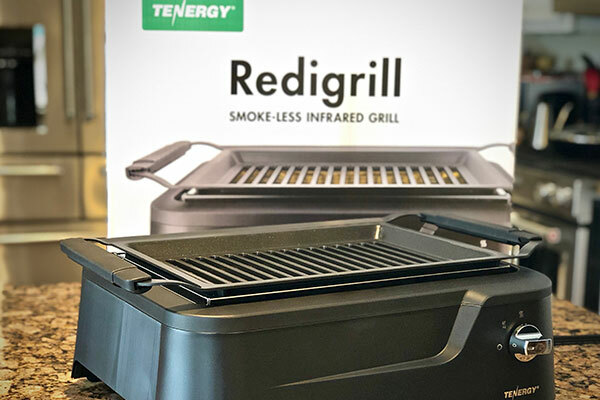 The infrared heat source cooks more evenly than the other smokeless indoor grills we have reviewed so far. It heats quickly and evenly while providing one of our best experiences so far, including the internal finished temperatures of the foods. If you are willing to sacrifice a little more space than some of the other appliances reviewed, the performance of this cooker won’t disappoint. While the brightness of the bulbs was a bit uncomfortable at some viewing angles, it was a minor inconvenience considering the excellent results. The short cord left a little to be desired, but the 1660 watts of power likely dictates the use of a shorter and thicker cord. This grill lived up to the manufacturer specifications, features, benefits and then some in the end.